R. Beghi, V. Giovenzana, S. Marai, E. Ferrari, R. Guidetti; Dep. of Agricultural and Environmental Sciences, Università degli Studi di Milano, Italy. 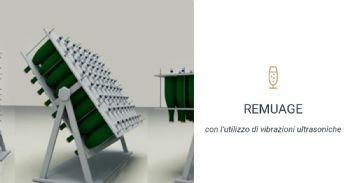 Nowadays, in modern wineries, the remuage process is carried out using automated riddling machines. These machines are a partial solution to the problem of the labour costs incurred for moving the bottles; however, they require a high initial investment, while the remuage process will last about 7 days. A winery using these methods might not be able to meet a suddenly increasing demand for bottles, due to long waiting times. Therefore, it is desirable to reduce the duration of the remuage phase. A research carried out by the Department of Agricultural and Environmental Sciences - Production, Landscape, Agroenergy of the Università degli Studi di Milano aims at providing an innovative remuage method which is alternative to available solutions. The study proposes the use of ultrasonic vibration to be induced in the bottles via a direct mechanical coupling, so as to be able to speed up the remuage operation. Advantageously, such ultrasound generates vibrations in the bottles, which cause the lees to slide faster along the natural slopes of the glass of the tilted bottle. The combination of ultrasound and bottle inclination will cause the lees to accumulate quickly in the neck of the bottle, thus speeding up the remuage phase.